With over 472,000 Instagram posts, #AcroYoga is growing in popularity among yogis and fitness enthusiasts everywhere and I’m definitely included in this growing bunch. AcroYoga was developed in the late 90’s through a combination of partner acrobatics, Thai massage and yoga. The result is often a beautiful image created through two or more people that is sure to inspire you to attempt it yourself! I recently came across some AcroYoga posts on Instagram and I instantly wanted to give it a go, just to see if I could do it! At first glance I thought some of the AcroYoga poses looked like a piece of cake but I quickly learned that it’s often harder than it looks, which only adds to the fun. After recruiting my fiancé for a few more AcroYoga sessions we quickly fell in love with the challenging yet rewarding practice. Builds Trust: AcroYoga involves contouring two bodies together in a way which requires a great deal of trust that your partner will securely hold you up in the air without allowing you to fall. In some cases this could be the base holding the flyer in the air with nothing but their feet! Demands Teamwork: AcroYoga is also referred to as Partner Yoga and for a good reason. It without a doubt requires teamwork to successfully pull off the poses and that means both participants must be contributing for it to work. You can’t just rely on the “base” to do all the work. The “flyer” has to contribute as well. Improves Communication: Every successful team has great communication and this certainly applies to AcroYoga. My fiancé and I took the approach of learning AcroYoga by just looking at a photo or video and trying to recreate it on our own, without any instructions. This took a tremendous amount of communication and bouncing ideas off of each other until we could find a successful outcome. Reduces Stress: Partner Yoga physically connects people which results in an increase of dopamine release and reduces stress. Not only does the physical contact release mood boosting hormones but the thrill of successfully completing a challenging pose can create a great deal of happiness as well. Creates Confidence: Don’t be intimidated by the photos and videos of advanced Yogis that make AcroYoga look effortless because it really can be done by any body type but that doesn’t mean it’s not a challenge. Partner yoga forces you to go outside of your comfort zone and try something new. Whether you are the base or the flyer the feeling of successfully pulling off a stunning pose is sure to make you feel better about yourself. Do you ever have those days when you head to the gym and you don’t have much time to spare or even a clue as to what you want to do for a workout? I think that happens to all of us! But what I have found, is that the key to making the most of those rushed days is to be efficient, have a plan and use the least amount of equipment as possible. This 45 minute workout requires only a barbell and a small amount of space so it will save you those precious minutes in the gym! Plus, even on the most stress filled days, completing a really hard workout will always give you a great feeling and this one will definitely do the trick. This workout is an awesome combination of strength training and cardio so give it all you’ve got for the entire 45 minutes. Pick a weight that is challenging but light enough that you won’t have to take too many breaks. Battle ropes are an excellent way to blast fight, burn calories and build muscle! They are becoming a popular piece of equipment in gyms but if your gym doesn’t have a rope you could easily bring your own just about anywhere and anchor it around a pool or post. A basketball goal would be an easy and accessible place to put your rope to good use! The options are pretty endless on how to get your sweat on with battle ropes but a great way to start is by picking any number of battle rope exercises and doing 20 seconds of work with 40 seconds of rest for 10-20 minutes. Watch the video below for 27 different ways to get an intense workout with a heavy rope. 26th Birthday Workout and Giveaway! 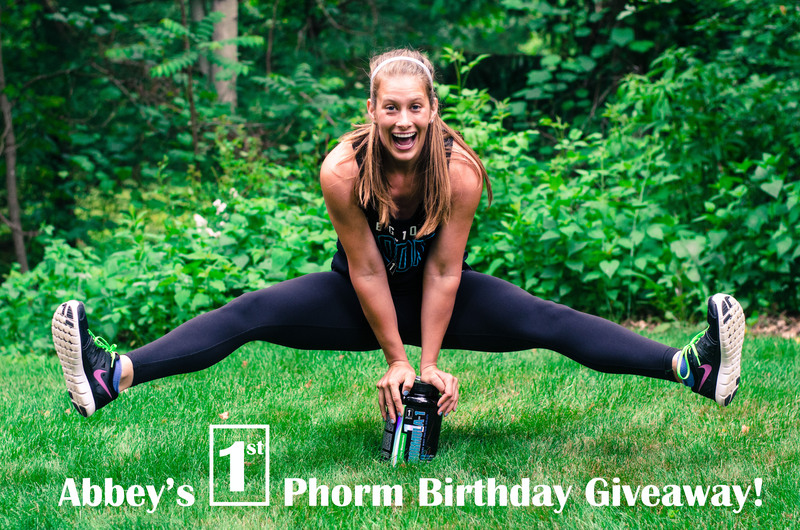 This year for my birthday I am giving away 1 jug of 1st Phorm Phormula-1 Juicy Watermelon Protein. 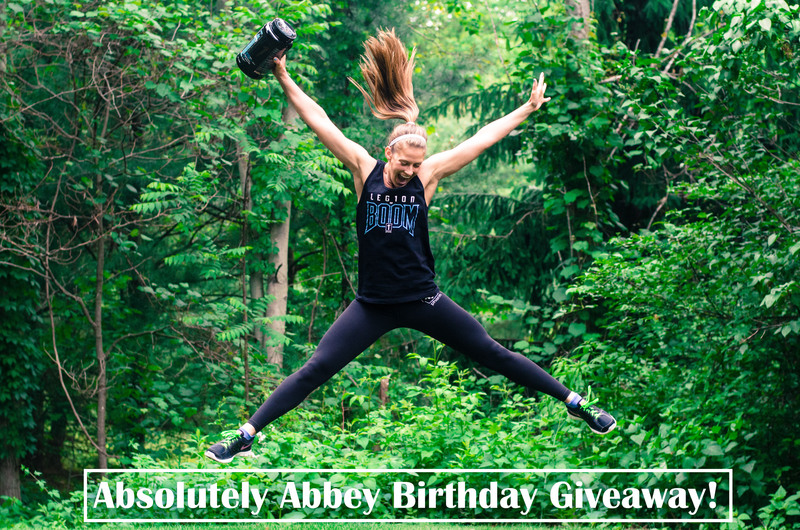 For your chance to win all you have to do is post a video or photo of you doing my Birthday Workout and share it on Facebook, Twitter or Instagram with the hashtag #AbsolutelyAbbeyBirthdayGiveaway. Also, tag me in the post! Must be completed by midnight June 17th and I’ll announce a winner on the 18th! *If you don’t have all of the equipment or can’t do something just make up something similar to do in place of that exercise. I accidentally didn’t record the split lunges, sorry! It’s just a lunge with your back foot resting on a box or a bench. Do you wake up in the morning with neck and back pain or tightness? Believe it or not, just 10 minutes of yoga in the morning can can help loosen up those tight muscles and ease your pain throughout the day! I was in a car accident nearly a year ago and I’m still dealing with pain in my neck and back as a result of a straight cervical spine and a bulging disc. I’ve seen countless doctors and physical therapists and I’ve found that nothing helps me more consistently than yoga! I think these poses are most effective if I do them in the morning before exercising or going to work. It’s common for people to become tight in the neck area if they are stressed out so be sure to take deep breaths in and out while doing each pose to calm your body and mind. Hold each pose for 5-10 breath cycles or whatever you have time for. From a standing position with your feet together or hip widths apart clasp your hands behind your back with your arms stretched out and fold over. Relax your neck and let your arms fall forward to a comfortable position. 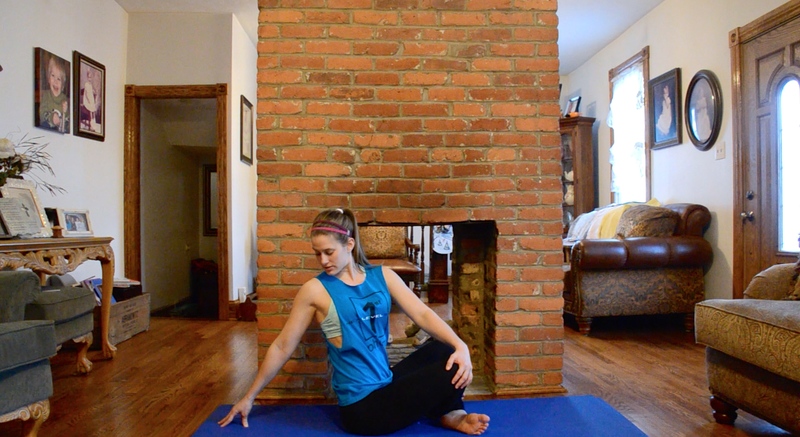 Start on your hands and knees and then bring your left shoulder and the side of your head as close to the floor as you can. Use your right hand to hold the rest of your torso up in a twisting position while on your knees. Then repeat on the other side. Start on your hands and knees and on an exhale, arc your back into the cow position with your eyes gazing forward. Then on an inhale arc your back in the other direction to go into the cat pose with your eyes gazing down at the mat. Sit on the floor and bend forward reaching for your toes and tuck your chin to your chest to get a stretch in your upper back and neck. Start in a seated position with your feet crossed under your legs. Bring your left hand to your right knee and take your right hand to the ground and reach behind you while sitting up as tall as you can. Repeat on the other side. Start standing straight up and go into a forward fold and then slowly walk your hands out in front of you and your feet behind you with your hips reaching towards the sky. Be sure to let your neck relax. Begin by lying on your stomach and then pushup onto the top of your feet and bring your hips off the ground with your arms pushing off of the ground below your shoulders and hold for a few breaths. Sit in a cross legged position with your back nice and straight and sit up tall. Makes circles with your head going up and down and around and then go in the other direction after a few breaths. 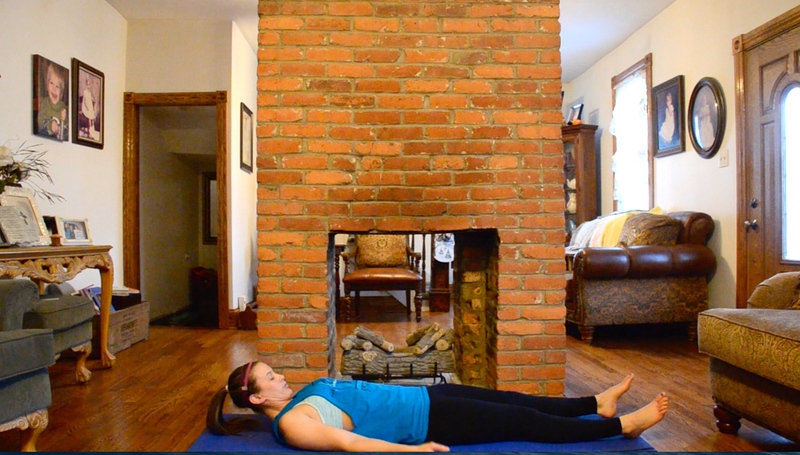 Begin by lying on your back in corpse pose and then simply tuck your chin to your chest and lift your head off of the ground. Try to hold it for 20 seconds and repeat 5-10 times. Begin by lying on your back and bring your knees to your chest and wrap your arms around your knees. Rock back and forth on your back to give yourself a back massage! Uptown Funk Workout – No Dancing Just Sweating! Who doesn’t love Uptown Funk by Mark Ronson and Bruno Mars? As soon as it comes on I can’t help but dance a little bit! Unfortunately, I have no rhythm or dancing skills but I do know some workout moves…or a few! So I made this “Uptown Funk Workout” for a way to get in a serious workout that’s loaded with a ton of fun! You don’t need a gym or any equipment, just enough space to safely jump around a little bit. Don’t be fooled by the warmup at the very beginning, if you stick it out until the end of the 4 minute and 30 second workout you are guaranteed to be sweating and your legs will be burning! Please let me know if you try this out and if you like it! I love music and fitness and I had a blast putting this together for you guys. If you want to see more things like this just let me know and I will get to work on it! Plus if you have kids you can multi task by taking your kids to the park and getting in a workout at the same time. Do 30 seconds of each exercise X 4 rounds. 1 minute each leg of lunge step back taps. 1 minute sit up to stand up with no hands. 1 minute each leg of opposite arm and leg crunch while kneeling. 1 minute full extension crunch. 1 minute cross back lunges. 1 minute each side of side plank raises. Don’t forget to stretch every day! Also I will be doing a full Concussion Recovery Update again soon but I did see a new doctor yesterday and he told me not to lift weights anymore because of the issues in my neck from the car accident back in May. So I’m sorry but all of my workouts for now on will be lacking weights but that doesn’t mean you still can’t use weights! Try these plank variations on a yoga ball for an extra challenge during your workout. Go for 10 reps on each leg for 3 sets. 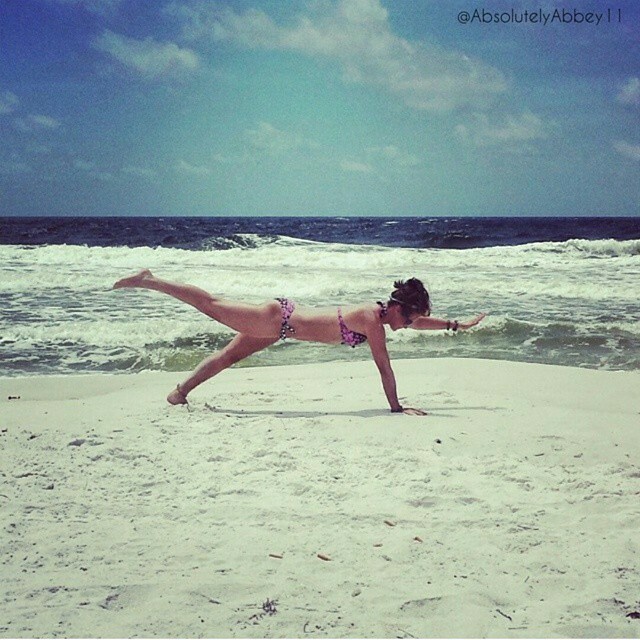 Planks are a great exercises that you can do just about anywhere and work your core, arms, legs and balance. 6 Minute Heart Pumping Workout! We’ve all been in that situation when there just isn’t enough time to get a workout in, or at least that’s what we think. When it seems like you don’t have enough time to workout, the secret is to just do a non stop workout with whatever amount of time you do have and if you have access to some weights that’s even better. This heart pumping workout only takes 6 minutes. And if all else fails you can always just do burpees when you only have time for a few minutes of working out!